Plans to build the world's largest offshore wind farm off the coast of North Devon are being unveiled. If it goes ahead the £3bn Atlantic Array scheme will have 350 turbines and generate enough clean energy to power more than 1,000,000 homes. The environmentally important island of Lundy is close to the proposed site, which is 12 miles off Ilfracombe. Farm Energy2 is the Devon-based company behind the scheme which could also create hundreds of long-term jobs. 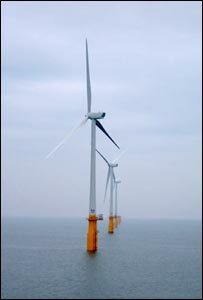 Farm Energy originated the London Array project in the Thames Estuary, currently the world's largest offshore wind scheme, which received offshore consents from the DTI and Defra in December 2006. Farm Energy Director Peter Crone said: "Atlantic Array would be a landmark project that would see the South West taking a significant step towards a more environmentally sustainable future." Matthew Spencer, chief executive of Regen SW, the renewable energy agency for South West England, said: "Atlantic Array is a game-changing proposal which will have a major influence on the Government's thinking on the best areas for offshore wind, currently assumed to be shallow water off the East of England coast and in the Irish Sea." The power from the wind farm would be transmitted to shore via submarine cables and then via underground cables into the existing National Grid substation at Alverdiscott. Devon County Council regional affairs spokesman Humphrey Temperley said: "The proposal represents the best opportunity for the local economy in northern Devon in a decade. Ilfracombe, Bideford and Appledore could all share the onshore benefits. "The wind farm could provide enough energy for all of Devon and there is potential for tidal power to be added later. "North Devon has excellent grid connections via Yelland and Alverdiscott and it would put the area at the forefront of renewable energy production," he said. The Atlantic Array scheme could supply 53% of the South West's domestic energy, offsetting 2.3m tonnes of carbon emissions every year. There will be all kinds of environmental, and planning and engineering issues to consider before the windfarm can be built but it could be powering more than 1,000,000 homes by 2018.